We all go to Chipotle and pay the little extra for Guac– at least I do. Yet, it’s crazy to think about just how easy it is to make this delicious dip at home! Honestly, the hardest part is finding ripe avocados. I don’t know about you, but I feel like my avocados take FOREVER to ripen and when they do, you have to move QUICK! Wait too long and you’ll be using those avocados for a hair mask. **sigh** Now while I love having luscious hair after an avocado hair mask, I much prefer eating this delicious buttery fruit…. And yes, avocado is a fruit. Have you not seen that big ol’ seed? I’ll admit, I’m still not used to the idea of the general public being crazy for avocados. I remember being a kid and eating avocados almost everyday whether it was for breakfast, lunch or dinner. Granted the avocados that I grew up eating are still not mainstream, it was avocados nonetheless. And they were cheap! Avocados are a huge staple in the Latino community. No matter the region, avocados were a must in Hispanic households. Then something interesting happened. Somewhere around the mid-2000’s, the mainstream caught wind of avocado and suddenly the secret was out. Everyone wanted avocados which obviously drove the price up and quality down. I don’t remember my grandmother having to wait forever and day for her avocados to ripen. It was rare for her to get an avocado that was a pure dud. The avocados from my childhood also tasted different. They were slightly sweeter and much more buttery. Today, I find that even when ripe, the avocados are a bit harder than usual and the taste is a bit off. Nonetheless, they’re still delicious and I happily buy tons of them each and every single week. It’s still super interesting to see non-Latinos enjoy them with the same vigor that we do. I love that I can find them in almost any supermarket and major retailer. Now Guac. Mmm. Of all the avocado dishes that have become mainstream– Guacamole is hands down the #1 darling of the bunch. This traditional Mexican delight is truly a gift and we have to thank Mexicans for this masterpiece. It’s a simple yet versatile recipe that you can freestyle to your desire. As you know, I’m a purist so I love the traditional Guacamole Recipe more than any other out there. Throughout the years, I’ve also noticed that even the traditional Guacamole Recipes varies, which I’m sure is to due to regional differences and saavy Grandma’s. Today I put my own spin on it as well! If you’re Caribbean like me, then you know that our avocados are much different than Hass Avocados. Caribbean Avocados or Florida Avocados/Skinny Avocados are much bigger and they have a bright green skin. They’re also much more watery than Hass avocados since they have less oil. Keep in mind that while Caribbean Avocados are an absolute delight, they’re terrible for making Guacamole. I made this mistake plenty of times until I finally ventured out into eating Hass Avocados. 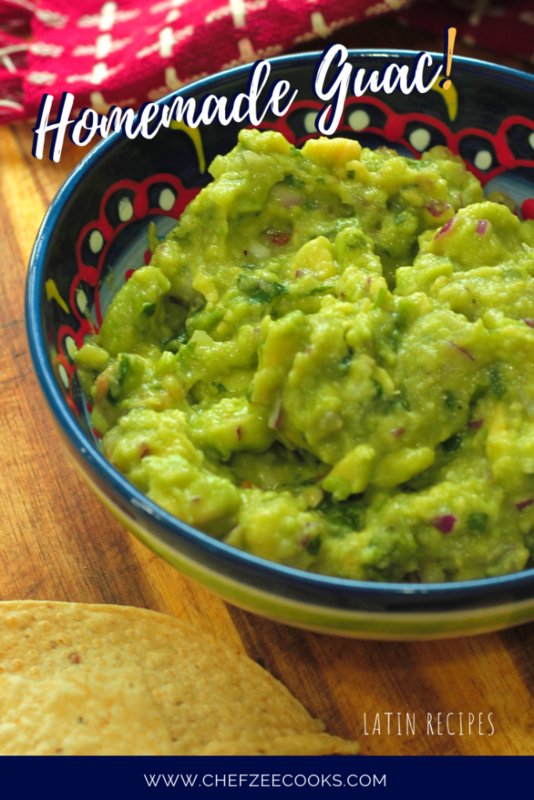 It’s important that you use perfectly ripe Hass Avocados to make Guac. If you use Avocados that are underdone then you’ll end up with a grainy unappetizing dip. If you use avocados that are overdone… well you know what that looks like. Brown and mushy! All in all, you have to mix all of your ingredients together making sure that your onions, tomatoes, and cilantros and finely diced. You also want to make sure to grate your garlic if you choose to add it. 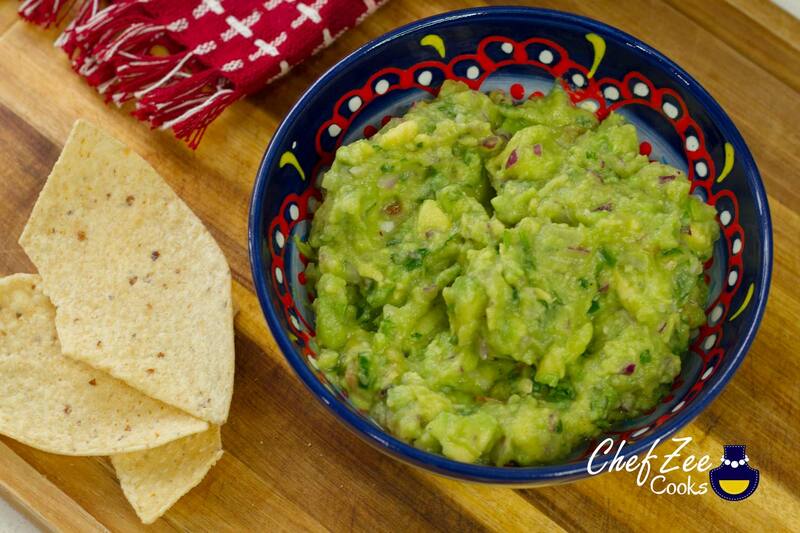 Don’t skip the fresh lime since this will help keep the avocados from oxidizing! Make this just before you’re about to serve it to ensure freshness. Guac will turn the longer that you leave you out. But wait! Don’t forget to Pin the yumminess to your Pinterest Boards! Add onions, jalapeño, lime, garlic, cilantro and tomato. Mix until well combined. Serve immediately and enjoy with chips, tacos, veggies or spread on a sandwich as a condiment! Avocados oxidize pretty quickly. Make sure to add fresh lime juice to keep this from happening. Serve immediately!